This Non-Disclosure Form (Long Version) is included in editable Word format that can be customized in Word or by using the included Wizard software. 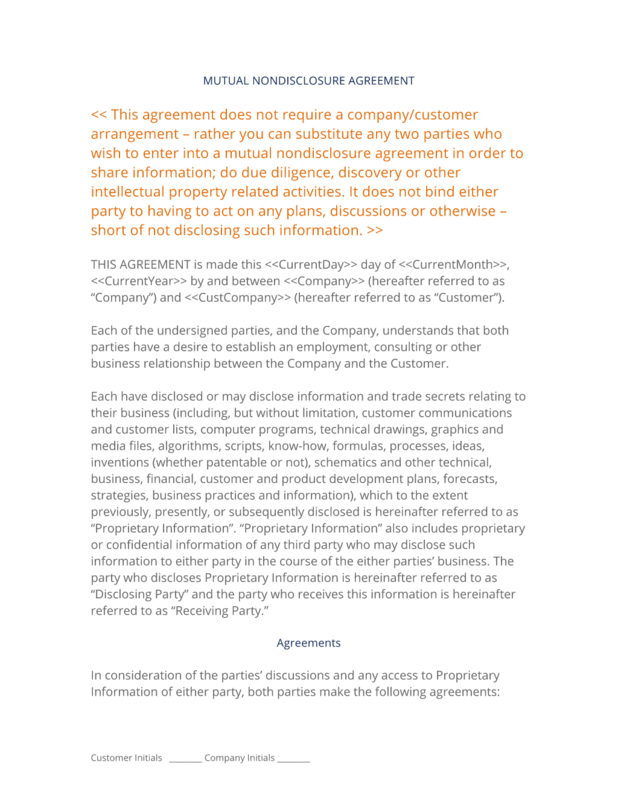 This agreement does not require a company/customer arrangement - rather you can substitute any two parties who wish to enter into a mutual nondisclosure agreement in order to share information; do due diligence, discovery or other intellectual property related activities. It does not bind either party to having to act on any plans, discussions or other wise - short of not disclosing such information. THIS AGREEMENT is made this Current Day day of Current Month, Current Year by and between Company Name (hereafter referred to as "Company") and Company Name (hereafter referred to as "Customer"). Each of the undersigned parties, and the Company, understands that both parties have a desire to establish an employment, consulting or other business relationship between the Company and the Customer. Each have disclosed or may disclose information and trade secrets relating to their business (including, but without limitation, customer communications and customer lists, computer programs, technical drawings, graphics and media files, algorithms, scripts, know-how, formulas, processes, ideas, inventions (whether patentable or not), schematics and other technical, business, financial, customer and product development plans, forecasts, strategies, business practices and information), which to the extent previously, presently, or subsequently disclosed is hereinafter referred to as "Proprietary Information". "Proprietary Information" also includes proprietary or confidential information of any third party who may disclose such information to either party in the course of the either parties' business. The party who discloses Proprietary Information is hereinafter referred to as "Disclosing Party" and the party who receives this information is hereinafter referred to as "Receiving Party. To hold all Proprietary Information disclosed by either party in the strictest of confidence and to take the same degree of care to protect such information as it does with its own Proprietary Information. No less than reasonable care shall be maintained by either party. Shall be granted the use of Proprietary Information only within the scope and purpose for which it was disclosed; to be used only for the benefit of the Company; shall not exploit or permit to be used or exploited Proprietary Information for the benefit of the employee or the benefit of another without the express written permission of the Company. Not to disclose or use any such Proprietary Information or any information derived therefrom to any firm, supplier, business, third party or other organization. Not to reverse engineer, tamper, alter or copy any such Proprietary Information. Not to export, allow for export, or distribute into the public domain any such Proprietary Information or product thereof. That all records, files, letters, memos, faxes, notebooks, drawings, sketches, reports, collateral, program listings, or other written, audio, magnetic, video, source or other tangible material containing Proprietary Information, whether the author or not, are exclusive property of the Disclosing Party and are entrusted to be used only to the benefit of this relationship, and shall be made available by the Disclosing Party immediately upon request by the Disclosing Party. Upon request the Receiving Party shall turn over all Proprietary Information owned by the Disclosing Party and immediately surrender any and all records, files, letters, memos, faxes, notebooks, drawings, sketches, reports, collateral, program listings, or other written , audio, magnetic, video, source or other tangible material containing any such Proprietary Information and any and all copies or extracts thereof. That each provision herein shall be treated as a separate and independent clause, and the unenforceability of any one clause shall in no way impair the enforceability of any other clauses herein. Both parties also shall not disclose the Proprietary Information to those employees who do not have a qualifiable need to know such information and, in any event, shall be liable for all improper disclosures by its employees. Without a grant of any right or license, the parties agree that the foregoing shall not apply with respect to any Proprietary Information that either party can document as being. Made available or becomes generally available to the public through no improper action or inaction by either party or any agent, consultant, affiliate, contractor or employee. Disclosed to it by a third party who did not owe a duty of confidentiality. In its possession or known by it without restriction prior to receipt from the other party. Independently developed without use of any Proprietary Information by employees who have had no access to such information. Either party may make disclosures required by law or court order provided it uses diligent reasonable efforts to limit disclosure and to obtain confidential treatment or a protective order and has allowed the Disclosing Party to participate in the proceeding. Either party shall immediately give notice to the other of any unauthorized use or disclosure of the other's Proprietary Information by the party or its employees or agents. The disclosure of any Proprietary Information of the Disclosing Party or requires that either Party to proceed with any transaction or relationship. Both parties understand that, except as otherwise agreed in writing, that the Proprietary Information which it may receive concerning future plans is tentative and is not intended to represent a contract of employment, retainment, nor does it constitute a decision by either party concerning the implementation of such plans. Proprietary Information provided to either party hereunder does not represent a commitment by either party to purchase or otherwise acquire any products or services from the other party. If either party desires to purchase or otherwise acquire any products or services from the other party, the parties will execute a separate written agreement to govern such transactions. This agreement supersedes all prior agreements, whether written or oral, between both the Disclosing and Receiving Parties as relating to the subject matter of this agreement. This agreement may not be altered, modified, amended or discharged, in whole or in part without the express written permission of both the Disclosing and Receiving Parties. This Agreement shall govern all communications, whether electronic, written, oral, or other medium between the parties made during the term of this Agreement. This Agreement shall expire upon thirty (30) days written notice by either party; provided, however, a Receiving Party's obligations under the terms of this Agreement shall continue with respect to all Proprietary Information disclosed prior to the expiration of this Agreement. Both the Disclosing and Receiving Parties obligations shall survive the termination of his/her employment and shall be binding upon all heirs, executors, administrators, and legal representatives. Both parties acknowledge and agree that due to the nature of the Proprietary Information, there can be no adequate remedy of law for any breach of its obligations hereunder, which breach may result in irreparable harm. Upon any such breach or any threat thereof, the party disclosing the information shall be entitled to appropriate equitable relief in addition to whatever remedies it might have at law. In the event that any of the provisions of this Agreement shall be held by a court to be overbroad as to scope, such provision or provisions shall be limited or eliminated to the minimum extent necessary so that this Agreement shall otherwise remain compatible with the law as it shall appear. The complete Non-Disclosure Form (Long Version) - with the actual formatting and layout - is available in this Contract Pack.